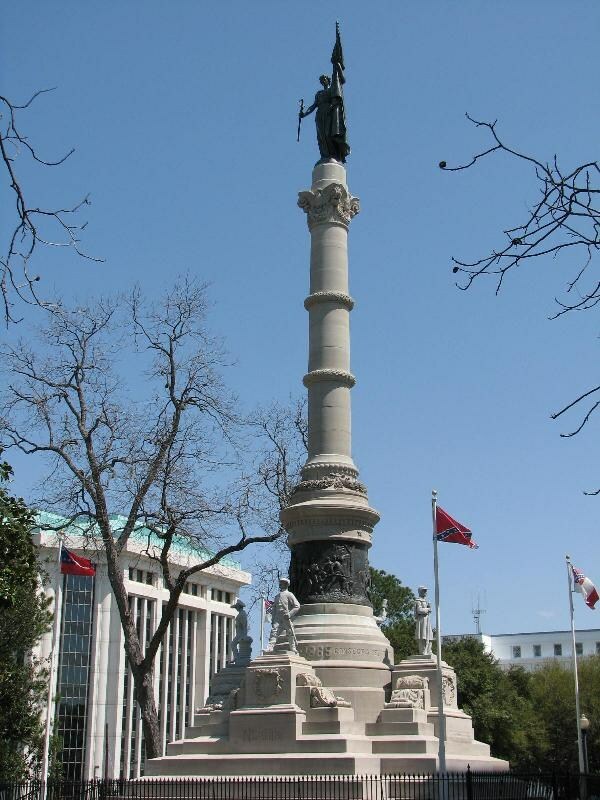 In addition to the Jefferson Davis monument I am also going to talk briefly about the Alabama Confederate Memorial Monument (1898), which commemorates the 122,000 men from the state who fought for the Confederacy. Students will be asked to reflect on the ways in which these monuments reinforced the politics of Jim Crow through a selective memory of the past. What do inscriptions such as the one above tell us about who these monuments were meant to include or welcome to the grounds of the Alabama state capitol and who they were meant to exclude? To what extent do these monuments reflect the nature of the legislation that took place inside the capitol throughout the period leading up to the civil rights movement? What does justice mean in such an environment? I am also going to ask students to reflect on the fact that the four granite figures, representing the four branches of the Confederate military, were completed just south of Boston in Quincy. So looking forward to heading out tomorrow morning with some incredibly thoughtful students. The reference to the “knightly race” reveals the true cause of the American Civil War. If slavery was the root, racism was the taproot. American slavery could not have existed if the notion that the superiority of one race over the other were not accepted as a God-ordained law of nature. The Constitution prohibits the assignment of titles of nobility, so there is no officially sanctioned class order in America as there is (or was) in European nations. The lord/serf relationship between equals is incompatible with the American ideal. So the only way for slavery to exist in America was to continue the European notion that the superior White race was justified in enslaving the inferior Black race. It was not only justified, but also commanded. The Texas Declaration of Causes of 1861 calls the “debasing doctrine” of racial equality “a doctrine at war with nature, in opposition to the experience of mankind, and in violation of the plainest revelations of the Divine Law.” In the pro-slavery Christian’s view, it was not a matter merely of legal justification, but of divine imperative: Whites must obey God by enslaving Blacks; Blacks must obey God by accepting their enslavement by Whites. Any other arrangement was immoral; any prohibition of slavery was a blight. Thus an irreconcilable difference was created that resulted in a Civil War that can also be said to have been a holy war between competing Christian views. Sadly, although slavery is no longer officially sanctioned, racism still exists. I have a White friend whose parents prohibited her from dating a Black man. I have listened to a couple of relatively recent sermons in which the antebellum Southern Christian view of slavery was espoused. Anti-immigrant sentiment is tinged with fear of other races and the fear of the “genocide” of the White race by intermarriage. The reverse exists, too: there are Black people who frown upon interracial dating and marriage, and interracial adoption is condemned as “genocidal” by some, including the National Association of Black Social Workers. There is also an unhealthy obsession with the race of the Jews and of Jesus in some circles. So it seems to me that we have a lot more digging to do, having pulled the top off of this dandelion. I think racism was an effect, rather than the “taproot.” You know what I think is the ultimate taproot of the whole slavery issue? What really caused the Civil War? I’m not kidding. Google “humid subtropical climate” and look at the map on Wikipedia. It’s basically an outline of the Confederacy. Geological factors influenced natural evapotranspiration (water cycle), which created different climate zones. Climate zone differences dictated the locations of agriculture, requiring that certain crops could only grow in specific places. And agriculture required a work force, which ultimately necessitated slavery … and slavery needed a justification. According to the Thomas Jefferson Foundation, “Enlightenment thinkers argued that liberty was a natural human right and that reason and scientific knowledge—not the state or the church—were responsible for human progress. But Enlightenment reason also provided a rationale for slavery, based on a hierarchy of races.” Whites became accustomed to power and privilege, and so racism remained even after slavery was abolished. I wouldn’t call myself a Determinist, but I’m rather skeptical of free will. I suppose I’m influenced by the idea of Causal Determinism, the notion that every action is caused by a preceding action in an unbroken chain of events going back to the beginning of the universe. I’m still a Compatabilist at heart, though: I think people can break out of these determined cycles if they choose to. No one chose to become a racist, but they DO choose to stay one. The great irony is that – as Grant and Sherman pointed out – the Southern armies could not have lasted a week in the field without the black slaves on the home front running their farms, looking after their kids, doing the work, helping their families. The incredible, invaluable black contribution to the Confederate war effort is almost always overlooked. A true slave revolt would have ended the Civil War in short order. During the 19th Century the word “Race” had a very different meaning than the current definition having to do with skin color or ethnic background. 1. The lineage of a family, or continued series of descendants from a parent who is called the stock. A race is the series of descendants indefinitely. Thus all mankind are called the race of Adam; the Israelites are of the race of Abraham and Jacob. Thus we speak of a race of kings, the race of Clovis or Charlemagne; a race of nobles, etc. Hence the long race of Alban fathers come. By the beginning of the twentieth century its meaning had clearly shifted given its usage at this time. 1. The descendants of a common ancestor; a family, tribe, people, or nation, believed or presumed to belong to the same stock; a lineage; a breed. The whole race of mankind.